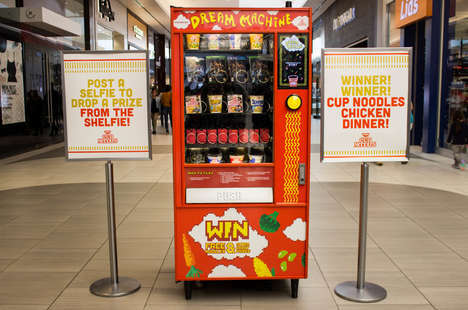 In Los Angeles County, hungry people can now share a selfie for a chance to enjoy a free Nissin Cup Noodles meal via the Foodbeast Dream Machine. The social media-powered vending machine accepts Instagram posts as currency and is programmed to give out free prizes in real-time in response to users who share posts with a specific hashtag on their feed. For participating, Instagram users have the ability to collect video games, gift vouchers, merchandise and Cup Noodles on the spot. The Foodbeast Dream Machines themselves take the form of a retrofitted 1970s vending machines that have been updated with Internet-connected Raspberry Pi computers.